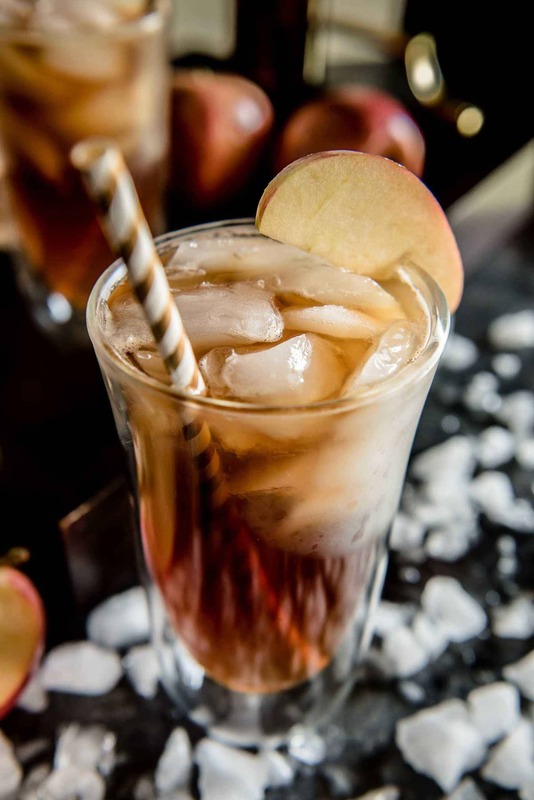 A simple seasonal twist on a popular rum cocktail – this Apple Cider Dark & Stormy replaces the ginger beer with autumn apple goodness. Raise your hand if you’ve had to crank down your air conditioner just to get yourself in fall mode. You know both of mine are waaaaay up. Story of this Florida girl’s life. From what I’m seeing all over social media, it seems like most of you are dealing with similarly warm weather. Even you guys all the way up north! What is the deal, Mama Nature?!? First, you hand deliver us not one, not two, but three nasty hurricanes…and now you can’t even start easing us into cooler weather?! Just a little??? Thank goodness fall cocktails by the pool do the trick. JUST TAKE ME TO THE APPLE CIDER DARK AND STORMY ALREADY! If you’d rather skip my (pretty darn helpful) tips and tricks, essential cooking info, and similar recipe ideas – and get straight to this deliciously easy cocktail recipe, just scroll right on down to the bottom of the page where you can find the printable recipe card! So, the Dark & Stormy. Talk about the cocktail love of my life. Next to a Moscow Mule, it’s one of my very favorite drinks to enjoy all year long. There’s just something very cozy and comforting about ginger beer. 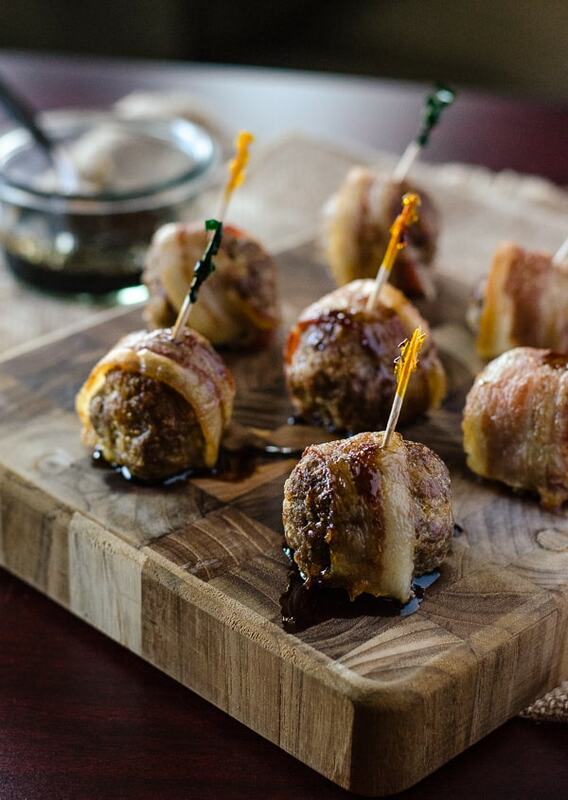 If you could plop a cocktail in the comfort food category, it would totally be there – for me, anyway. This love probably goes back to my love of non-alcoholic ginger ale, since Nana used it as a cure-all whenever I got sick. At this point, as an adult, I’m convinced it’s mostly a placebo. I do know that ginger has natural healing properties, so whether it’s for an upset stomach or to soothe a sore throat, it’s always been a go-to for me. Placebo or not. This is not your standard Dark & Stormy, though. 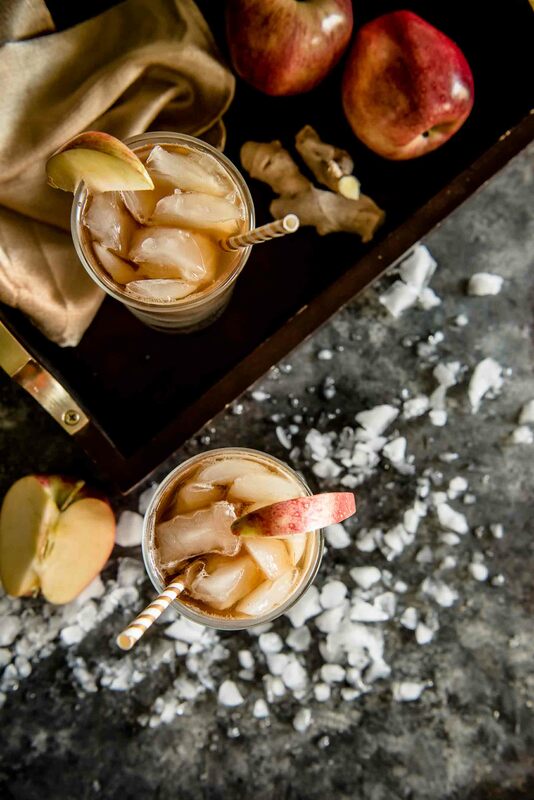 Ginger is very much a fall flavor, but I thought it might be fun to shake it up for Apple Week and toss a little cider in the mix. I tried this with both ginger beer and hard apple cider while I was recipe testing. 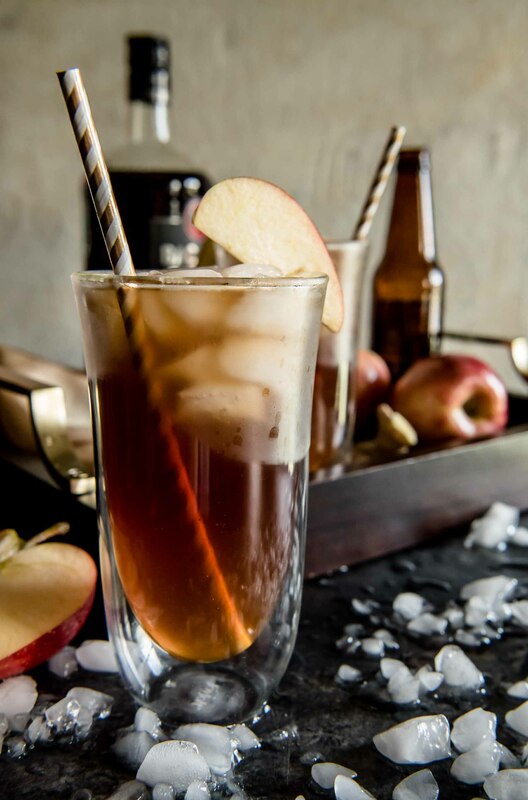 I preferred it with ginger beer (obvs), but if it’s not your thing – I promise, the hard cider with make your autumn-craving tastebuds just as happy! Cheers to fall…even if it hasn’t shown up for the party yet. 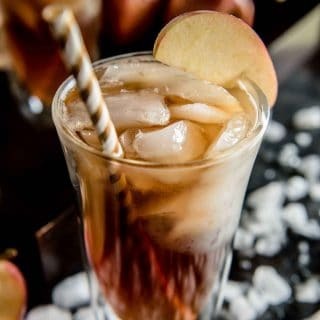 A simple seasonal twist on a popular rum cocktail - this Apple Cider Dark & Stormy replaces the ginger beer with autumn apple goodness. Fill a highball glass with ice. 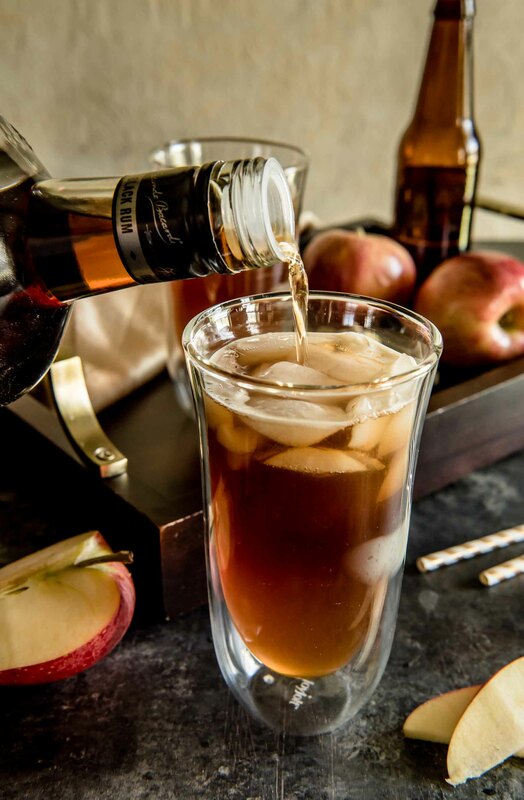 Pour in apple cider, then hard cider (or ginger beer), then float rum on top. 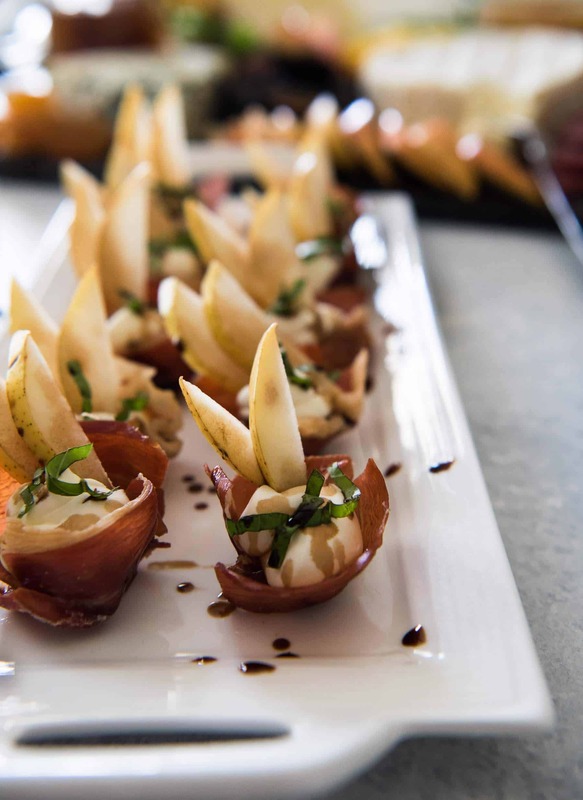 Garnish with an apple wedge and a fun straw, if you're feeling fancy. Still thirsty for more creative cocktails? How about a couple apps that would pair well with this drink? WANNA WIN SOME AMAZING #APPLEWEEK PRIZES?? Surf on over, check them out, and get your entries in! I have never had a Dark and Stormy. How did that happen? I will have to try one. Thanks for the recipe. 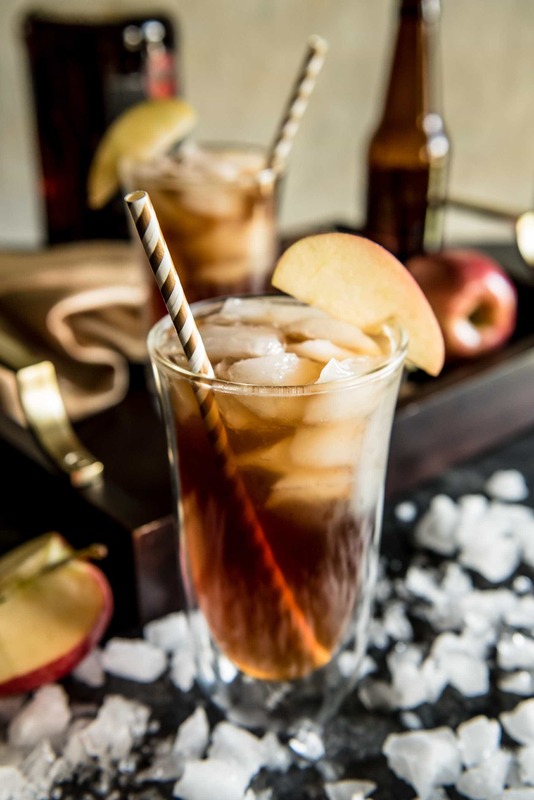 What a perfect fall drink, cooler weather or not! I have never tried to make apple cider before. Added this recipe to my must-have list this week, I bet my kids will love this.